If you own a large studio, you are probably short on time. You need for your studio to function smoothly so that you can focus on relationships with your studio families, the other teachers on your team, and on your teaching. It’s imperative that you have strong systems in place to manage the business end of your music lessons. As one of your primary tools, your website needs to work smoothly, engage parents, and help you to accomplish your studio goals. But technology changes quickly, and it’s hard to invest the time in keeping websites clean, simple, and up-to-date. As our attention span shrinks to match the speed of technology, we are increasingly impatient with websites that feel confusing or overwhelming. Parents who arrive at your website need to know exactly where to go - immediately. If a parent arrives at your website and sees a row of vague page names across the top (About, Learn, Studio, Students, Schedule, etc. ), that parent will quickly become impatient and leave. Hick’s Law says that the more options you have, the longer it will take for you to make a decision. When those options aren’t clear, it will cause frustration on top of that. As a large studio with a number of programs, it’s imperative that you keep your website and navigation as simple and clear as possible. 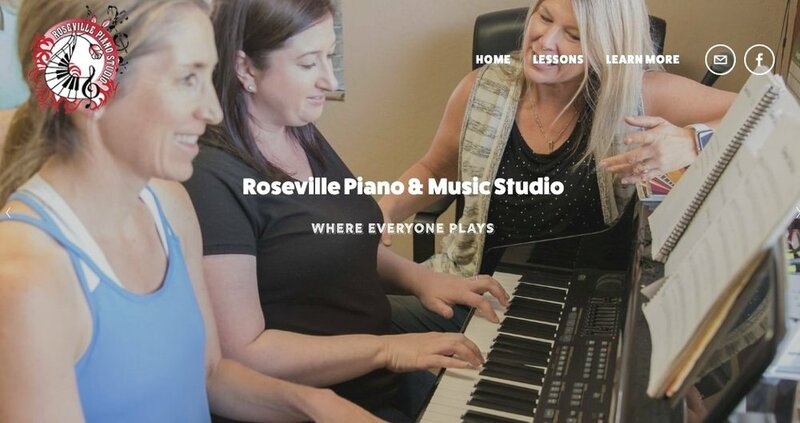 Diane, the owner of Roseville Piano & Music Studio in Roseville, California, has just over a hundred students enrolled and employs two teachers. She offers four programs for different age groups. We recently built a new website for Diane, and our primary goal was to keep everything simple and clear. The focus of Diane’s website is to get parents from her homepage to her contact page as quickly and easily as possible. It was also vital that parents feel at home at Roseville Piano Studio; Diane has worked hard to build a warm, welcoming environment for all of her studio families. It’s important to portray your studio - particularly when it’s large - as a place that is friendly and unintimidating. 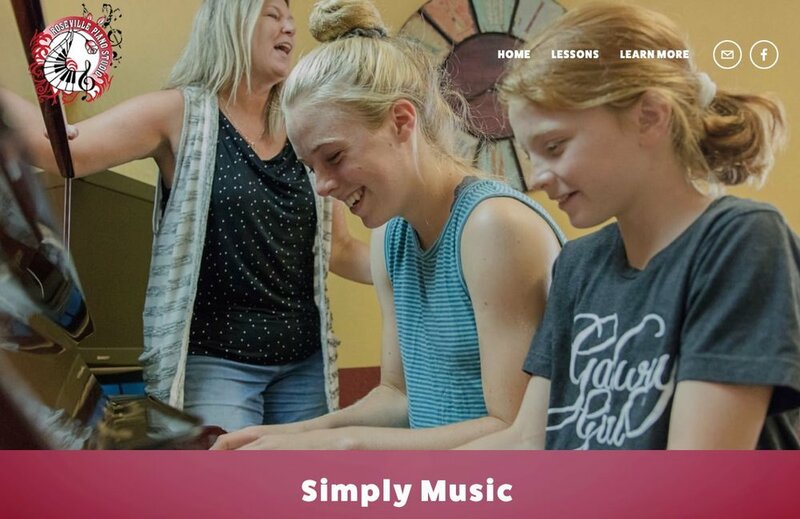 When arriving at Diane’s homepage, you can see a slideshow of Diane’s studio that invites students of all ages into her unique studio experience. Diane’s navigation bar is simple and clean. By hovering over “Lessons,” you can read about each of the programs offered at Roseville Piano Studio. By selecting “Learn More,” you can find the enrollment page, the FAQ page, meet Diane and her team, see a gallery of studio photos, and contact Diane’s team. Current students have their own page that allows them to pay tuition or log in to their My Music Staff account. You can do this, too - and it’s easier than you think. Start by deciding where you want parents to end up. Diane wanted parents to contact her prior to enrolling, so all of her CTA (call to action) buttons lead to her contact page. If you want parents to enroll right away, label all of your buttons “Get Started” or “Enroll” and link them all to your enrollment page. Next, think about what information parents will need to have prior to reaching that goal. For example, do you want them to read about the program that’s age appropriate for their child? Put your program pages in a drop-down menu and clearly indicate ages for them. Finally, eliminate all information that’s not absolutely necessary. There is plenty of time to share detailed policies, information on materials needed, and scheduling options once a parent is convinced that your studio is the right place for their child. Right now, focus on engaging parents and helping them picture their child (or themselves) in your studio. Your website is so much more inviting and clear for parents. Enjoy the results of a high-functioning website - and being able to turn your attention back to your students and your team. How does your website look now? Do you have any questions about the process of simplifying? I’d love to hear from you.